When I was studying in Italy, I would often go down to the mensa (university cafeteria) for dinner. When I started the year off, I was a bit shy, so anything comforting (like food) helped me along. 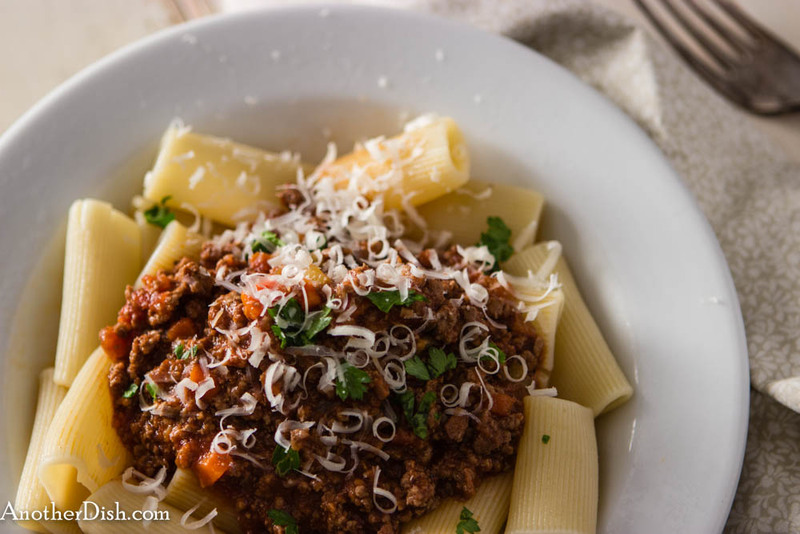 I loved the pasta con ragù alla bolognese — delicious and very comforting! Italian restaurants that I’ve dined at here in the US that have this on the menu don’t seem to get it right, so made it my mission to find an authentic recipe for ragù bolognese. I found and adapted a recipe from Saveur Cooks, Authentic Italian, which is spot-on! Some may not prefer chicken liver, but it’s used in a small amount and it’s a must! The liver, prosciutto, milk, wine (and all the other ingredients) are what make this dish authentic to me. I hope you’ll try this dish! Heat oil in a Dutch oven over medium-high heat. Add onions and saute until translucent (but not browned), about 4 minutes. Add celery and carrot and saute for another 3 minutes. Add prosciutto and chicken liver, stirring about 3 minutes. Increase heat to high. Add ground sirloin, salt, pepper and nutmeg. Stir constantly, breaking up meat so that it is very fine (I press the uncooked meat with the back of a wooden spoon and stir, stir stir) for 5 minutes. Add wine, stir and bring to a boil. Cook for 3 minutes. Reduce heat to medium and add milk, stirring until milk has evaporated, about 4 more minutes. Add broth and tomatoes; bring back to a boil, stirring constantly. Reduce heat to low and simmer very gently for 2 1/2 hours. Season to taste with additional salt and pepper (I added another 1 tsp salt and thought that was perfect). Serve over rigatoni and sprinkle each serving with the parsley and parmesan. This entry was posted in Comfort Food, Italian, Main Dishes, Pastas and Grains and tagged Comfort Food, Cooking, Food, Food Photography, Foodie, Italian Food, Recipes on November 4, 2013 by AnotherDish. Beautiful picture. Looks delicious! I will be trying this out shortly! Thumbs up on the post. Thanks so much, mealsandreels, for the great comment! Will it taste as good if I use pork? Most of my family member do not eat beef. It’s a religious thing. I love the chicken liver in there – it always adds so much flavor to meat sauces. Hi Ronit, yes, I completely agree with what chicken liver does for a sauce!